Although the mushrooms involved are not particularly difficult to recognize, there has been a lot of confusion in field guides and technical treatments about Hypsizygus tessulatus and its close relative Hypsizygus ulmarius. 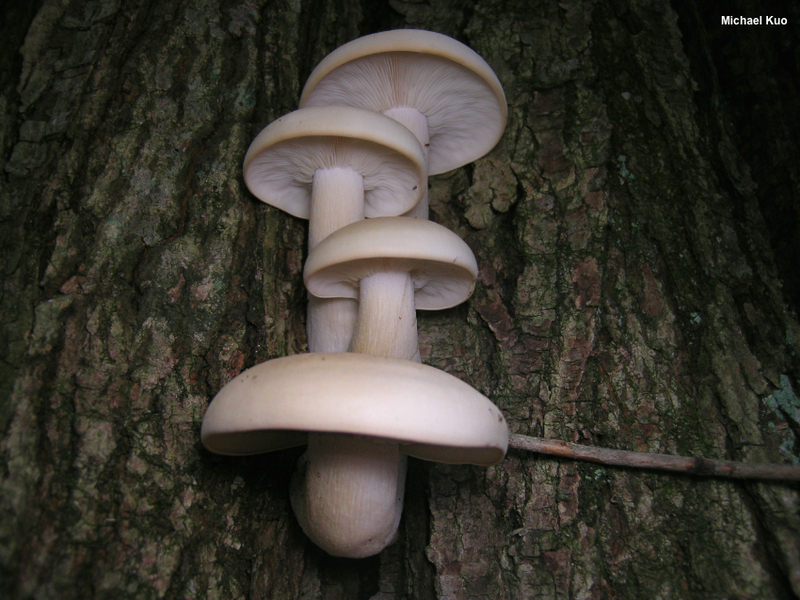 Both of these species grow from the wood of hardwoods and feature medium-sized, pale, convex caps, along with white spore prints. 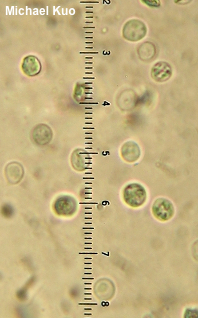 According to Canadian mycologist Scott Redhead (1986), the two species can be separated on the basis of their spore sizes and growth habits: Hypsizygus tessulatus has small, nearly round spores 4–5 µm long and often grows in clusters, while Hypsizygus ulmarius has broadly ellipsoid spores 5.5–6 µm long and usually grows alone. Additionally, the former species often features watery spots on the cap when fresh, and is most often found on aspens, cottonwoods, and sugar maple—while the latter species does not feature watery spots and usually grows on elms or box elder. Hypsizygus marmoreus and Hypsizygus elongatipes are synonyms; the former name is often used to refer to a cultivated, commercially available version. "Hypsizygus tessellatus" is a frequently encountered misspelling. Regarding the putative "medicinal" properties of this mushroom: I am sorry to put it this bluntly, but this mushroom is not going to cure your cancer, nor any other ailment you may have—and if someone has sold you a product based on the assumption that it will, you have purchased some snake oil from a witting or unwitting charlatan. The only health benefits associated with consuming species of Hypsizygus result from the exercise involved with hunting for them in the woods. There is no legitimate scientific support for the idea that mushrooms are medicinal in any specific, eat-them-to-get-better way. None. There is only pseudoscience, bad science reporting in the mainstream news media, and very wishful science reporting in the alternative health media. For further information, see Nicholas Money's "Are mushrooms medicinal?" (2016). Ecology: Saprobic; usually growing in clusters of two or three; widely distributed in eastern and northern North America, and sometimes reported from the Rocky Mountains and the West Coast; fall. The illustrated and described collections are from Michigan and Québec. Cap: 4–8 cm; convex, becoming broadly convex with a slightly inrolled margin; dry; bald; whitish to buff or very pale tan; sometimes "tessulated" with watery spots when fresh and young. 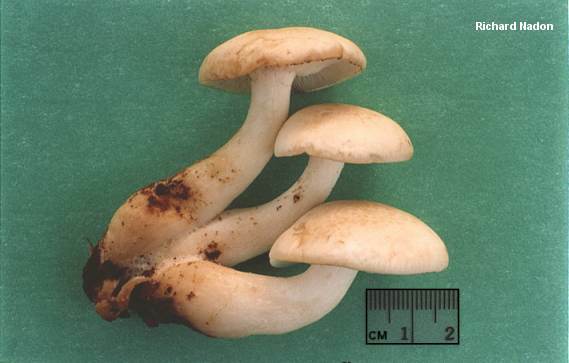 Gills: Attached to the stem; close; short-gills frequent; whitish; not bruising. Stem: 3–8 cm long, 1–2 cm thick; equal or slightly club-shaped; dry; bald or very finely silky; whitish to very pale tan. Odor and Taste: Odor not distinctive, or slightly mealy; taste not distinctive. Microscopic Features: Spores 4–5 µm; subglobose; smooth; hyaline in KOH; inamyloid. Lamellar trama parallel. Basidia 4-sterigmate. Hymenial cystidia not found. Pileipellis a cutis; elements 2–4 µm wide, often clamped, smooth, hyaline in KOH. REFERENCES: (Bulliard, 1791) Singer, 1947. (Saccardo, 1887; Kauffman, 1918; Redhead, 1986; Phillips, 1991/2005; Breitenbach & Kränzlin, 1991; Lincoff, 1992; Barron, 1999; McNeil, 2006.) Herb. Kuo 09110403.